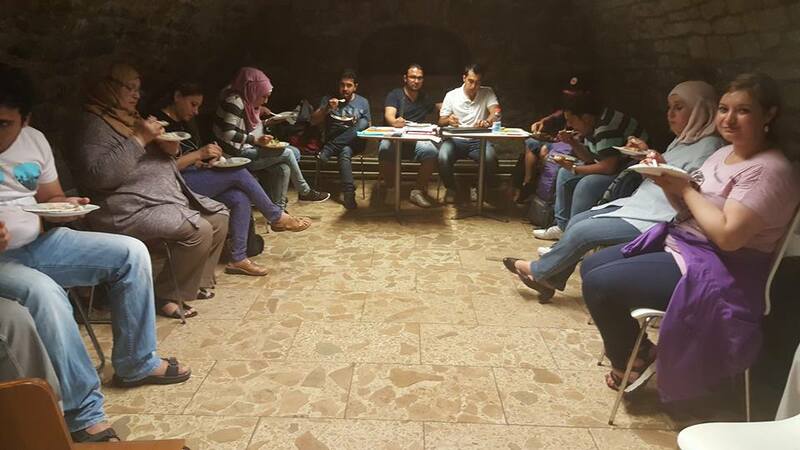 The general emphasis of refugee’s internal meeting on 16.09.2016 focuses on how the responsible authority in charge of refugee’s affairs treats them in the local government of Lutherstadt Wittenberg. How the Foreign Office and the specialized Service of Law in Lutherstadt Wittenberg abuse the German Foreign Laws in an attempt to deny us our legal rights. How the Foreign Office and the specialized Service of Law in Lutherstadt Wittenberg disrespect and dishonor the German Juridical decisions in view to deny us our legal rights. Bodies will be back is a dedication to the experiences of the marginalized and exploited people in societies. 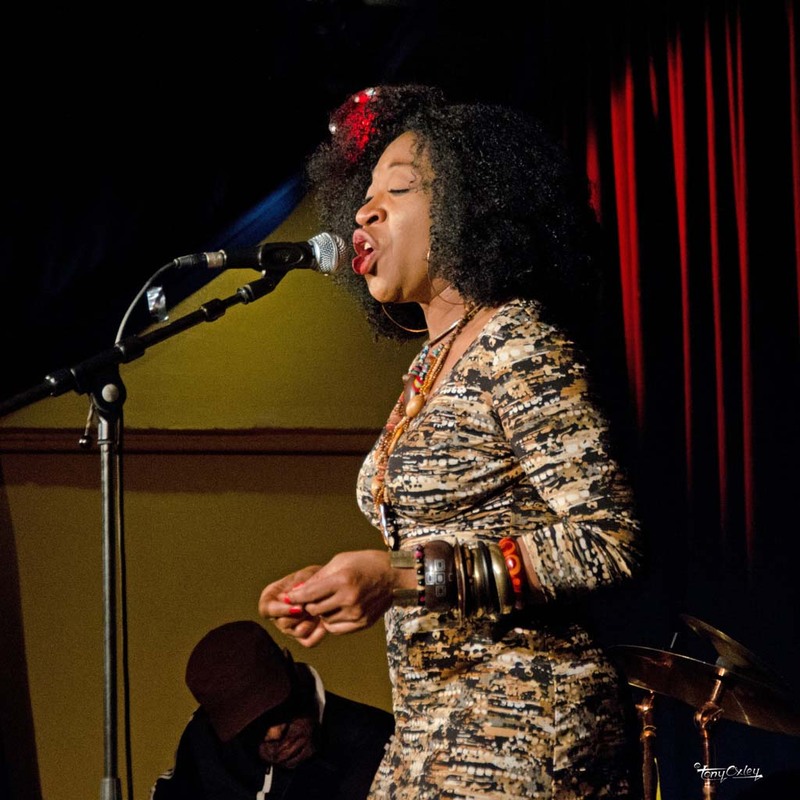 Am Freitag, den 9.9. um 20 Uhr, zeigt die Initiative in Gedenken an Oury Jalloh (https://initiativeouryjalloh.wordpress.com/) zusammen mit dem Wearebornfree!Empowerment Radio (We!R) (www.wer.oplatz.net) (Einlass 19:30) im «West Germany» (Skalitzer Straße 133, 10999 Berlin) einen Dokumentarfilm über den Fall Oury Jalloh, stellt die eigene Arbeit vor und freut sich danach auf Fragen. Issaka, a comrade of the Lampedusa group, wanted to go back home since many months because he is not seeing a perspective here - the live as a refugee has made him ill - but first, he needed his passport and, second, he could not go on the journey alone. 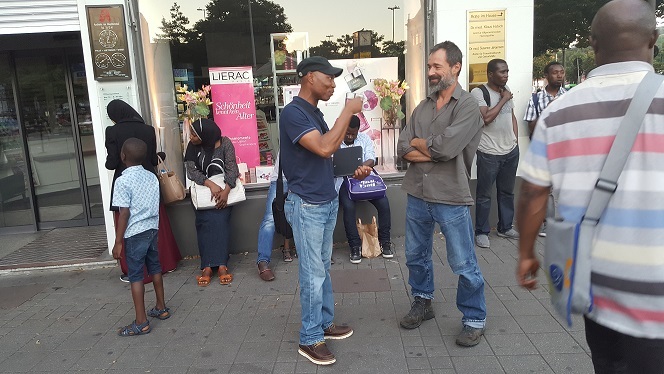 Instead, since May he is in prison because - having no money - he used the HVV (public transportation) without ticket and - panicking in confrontation with people in uniform as a traumatized refugee - he resisted the policepeople who arrested him. Erfurt State Court verdict: 'Police are Racists, too!' Lawsuit Ended in Acquittal. Erfurt State Court, 24.08.2016: 'Police are Racists, too!' Lawsuit Ended in Acquittal. The appeal process against Igor ended in acquittal on Tuesday, 23.08.2016. Yesterday, in the Erfurt State Court of Thuringia, it was the agreement by the judge and state attorney that the statement 'Police are racists, too!' is no criminal offence that surprised most. The judge and state attorney made clear that Igor's behaviour does not justify a conviction. Read more about Erfurt State Court verdict: 'Police are Racists, too!' Lawsuit Ended in Acquittal. First note refugee activist from Bremen on Refugee-Migrant Political Community Meeting in Hamburg, 18.08.2016. Be realist, look for the impossible! we, refugees and migrants as a part of oppressed people have a very strong desire for a world without war , discrimination , social exclusion, exploitation , colonialism, racisms , sexisms and ... we know by our experience that we can achieve this kind of free society for all of human beings through our solidarity and collective fight for freedom. Important NOTICE! For participants of refugee-migrants meeting this week in Hamburg on Thursday, 18.till Friday,19.08.2016. We want to inform all interested participants that our Financial situation is very critical and we can not support financially the transportation of interested refugees who want to come from Southern Germany to Hamburg. Read more about French/English/Deutsch: "We are coming to you" - The refugee community needs you! A visit to the Bimbia Slave port where Africans were kidnapped from the hinterland and transported to the Americas. There was no Cigarette Lighter in Cell Nr. 5! Oury Jalloh cannot have set himself on fire! There was no Cigarette Lighter in Cell Nr. 5! Who did actually set the fire in cell No. 5? Oury Jalloh cannot have set himself on fire! Read more about There was no Cigarette Lighter in Cell Nr. 5! 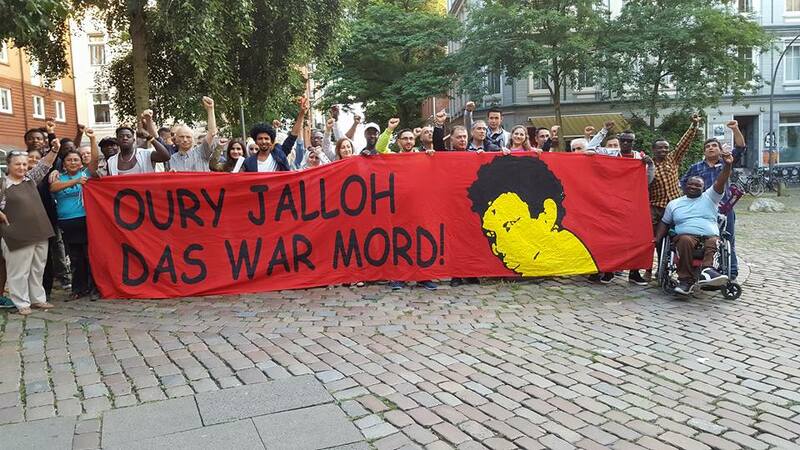 Oury Jalloh cannot have set himself on fire! Hamburg: „Wir kommen zu euch“ - Die Flüchtlings-Community braucht euch! "We are coming to you" – The refugee community needs you! We will reconcile our differences and unite our political resources to empower our struggles for an independent space to nuture and protect our community. Read more about Hamburg: "We are coming to you" – The refugee community needs you! "The idea of naming a day “The Day Of Refugees Agenda” to remind everybody of the injustice we’re suffering was proposed by the women from Kiel. This event could be organized in different cities. The idea found ground by the participants. It was said that the „UN refugee day“ was initiated by members of the rich countries that participated in the wars that created most of the refugees worldwide and then cry with crocodile tears in solidarity to celebrate it. If the refugee community can declare their date of solidarity, it will be inspiring for our community struggles nationwide here and in Europe. This idea “The Day Of Refugees Agenda” will be discussed in the local groups." 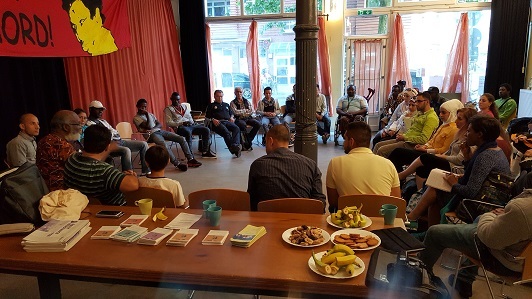 Our Presence Reflects The Power Of Our Movement: Solidarity Networking of Refugee Communities Will Unite the Refugees Struggles for their inalienable Rights Worldwide. Highlights of the Community Meeting: Networking and Working groups on the 28th -31st of July in Jena. Place: Internationales Centrum, Haus auf der Mauer, Johannisplatz 26, 07743 Jena. You find more and other texts below in English, French, Spanish, Russian and Serbo-Croatian languages. 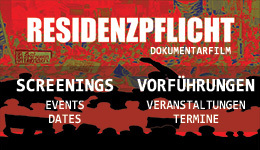 Refugee Solidarity Call from Augsburg! kaempfen gegen Diskriminierung und Rassismus! In Solidarity with Refugee Call from Augsburg! 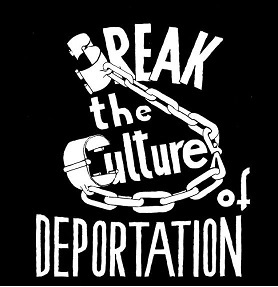 Friends we need your Solidarity and Support for people from all over the glob who are facing deportation in Germany! it's a call for equal rights for everybody! Unsere Bewegung hat sich aus einer kleinen Gruppe von Menschen, die in „Duldung“ leben muessen gegruendet, um auf ihre Situation aufmerksam zu machen und fuer ihre Rechte einzustehen. Die Gruppe ist im Verlauf von einigen Wochen angewachsen und hat sich für alle Menschen geoeffnet, die den Willen haben, uns zu unterstuetzen und unsere Situation zu verändern. 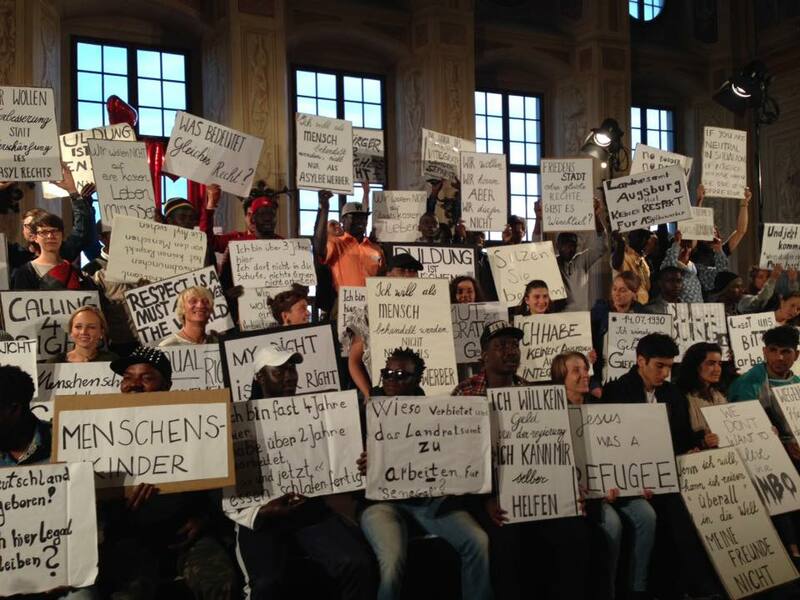 Read more about Refugee Solidarity Call from Augsburg! kaempfen gegen Diskriminierung und Rassismus!